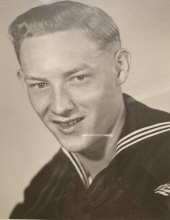 Robert Gerald Kilseimer, age 93, of Billings, MT, died Monday, February 4, 2019 at his home surrounded by his family. He was born February 4, 1926, in St. Paul, Minnesota, the son of Robert M. and Rose (Schloss) Kilseimer. He was raised in Glendive, MT, and married Dona Somers on November 6, 1949. They had two children Ardyce and Ron Kilseimer. He was in the Navy as a Seaman 1st Class Radioman and worked for the Burlington Northern Railroad for 40 years as a telegrapher. He was preceded in death by his parents Robert M. and Rose Kilseimer, his wife Dona Kilseimer and his brother Irwin Jack Kilseimer. Survivors include his son Ron Kilseimer of Billings, his daughter Ardyce (Dave) Swain of Billings; two grandchildren Aaron and Teal Swain and two great-grandchildren Wyatt and Weston Swain. To send flowers or a remembrance gift to the family of Robert Gerald Kilseimer, please visit our Tribute Store. "Email Address" would like to share the life celebration of Robert Gerald Kilseimer. Click on the "link" to go to share a favorite memory or leave a condolence message for the family.